TEG Dainty, Nice Events and Soundworks Touring are excited to announce that music’s most electric and dynamic instrumental duo will tour Australia & New Zealand this November/December. 2CELLOS will bring their game-changing sound and style to the most popular melodies ever written for classic and contemporary movies and television with The Score & More Tour. The tour opens up in Perth on Friday 23 November, and moves on to Melbourne on Saturday 24 November, Adelaide on Monday 26 November, Sydney on Wednesday 28 November, Gold Coast on Friday 30 November and Brisbane on Sunday 2 December before winding up in Auckland on Monday 3 December. Tickets go on sale at 10am local time on Wednesday 20 June for the seven-city tour. 2CELLOS recently performed at the UEFA Champions League Final to an estimated global audience of 350 million, entertaining viewers with the UEFA Champions League anthem and a cover of the White Stripes’ “Seven Nation Army” at the Olimpiyskiy Stadium in Kiev, Ukraine. The young Croatian cellists (Luka Sulic and Stjepan Hauser) continue to soar worldwide, taking the cello to unimagined heights with their incredible talent and undeniable passion. Their playing style breaks down the boundaries between different genres of music, from classical and film to pop and rock. 2CELLOS have no limits when it comes to performing live–equally as impressive playing Bach and Vivaldi as they are rocking out to AC/DC and Iron Maiden. The pair first gave local fans a taste of their fourth album Score during a spectacular performance filmed live at the Sydney Opera House in 2016 (watch here), ahead of its 2017 release. Now–off the back of two wildly successful past tours–they’re headed back to an eagerly awaiting AUS/NZ fan base with The Score & More Tour. Score celebrates the most popular and enduring music ever written for classic and contemporary movies and television. Exploring a more traditional musical sound, 2CELLOS recorded Score in summer 2016 with the London Symphony Orchestra, with conductor/arranger Robin Smith at the helm. Sulic and Hauser also co-produced Score with Nick Patrick (Jackie Evancho, Il Divo, Plácido Domingo). In advance of the release of Score, the first video from the album–a medley of themes from Game of Thrones–racked up over 5 million views on YouTube (now 22 million+ views). Score also features memorable themes from The Lord of the Rings, Gladiator, Titanic, Braveheart, The Godfather, Cinema Paradiso, Breakfast at Tiffany’s, Schindler’s List and many more, by some of Sulic and Hauser’s favourite, Oscar-winning composers such as Hans Zimmer, James Horner, Ennio Morricone, John Williams and Henry Mancini. 2CELLOS rose to fame in 2011 when their version of Michael Jackson’s “Smooth Criminal” took the world by storm. The YouTube video became a massive viral hit leading to a record deal with Portrait/Sony Music Masterworks and an invitation to join Sir Elton John on his worldwide tour. Their third album Celloverse debuted at #1 on both the Billboard Classical and Classical Crossover charts, as well as charting in the Billboard Top 200. 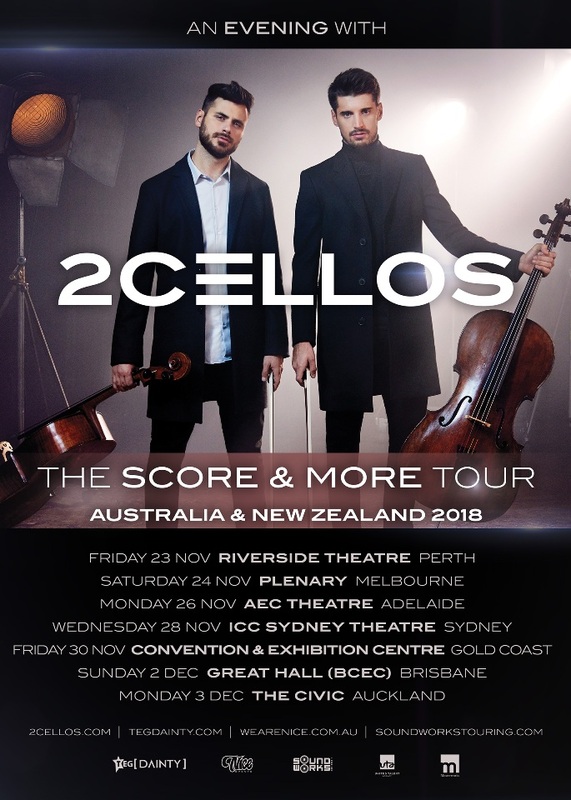 The world tour that followed the release of Celloverse resulted in 42 sold-out dates and a captivated AUS/NZ audience. The viral video for “Thunderstruck” from that album has racked up more than 119 million views to date on YouTube. They were the first instrumentalists to be featured on Glee and have appeared multiple times on The Today Show and The Ellen DeGeneres Show in addition to The Tonight Show and The Bachelor Live Wedding Special among others. Aside from their huge following online where their new YouTube hits continue to amaze, 2CELLOS’ main focus is performing live. In addition to many sold-out solo tours, the duo has performed in such prestigious venues and events as Madison Square Garden, Paris Olympia, Queen’s Diamond Jubilee, and the Emmy Awards. Onstage, their collaborators have included the Red Hot Chili Peppers, Queens of the Stone Age, George Michael and Lang Lang. Visit www.tegdainty.com for tour and ticket information.